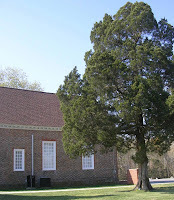 This greatly modified church is located some twenty miles northeast of Richmond on Route 30 in King William County to the south of the roadway in a large, grassy area with mature cedar and hardwood trees. The name Mangohick is reputed to be of Native American origin as is as well the name of a nearby creek. 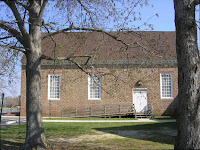 The original building was of average size, 61' x 28' and is of typical bonds: English bond below the water table and Flemish bond with glazed headers above it. 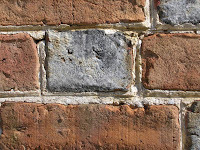 There are several bricks with initials, some modern and some of possible colonial origin: particularly over the south doorway with the date 1731 and the initials WV? The water table is characterized by a beveled edge where it meets the walls, and there are ventilation holes still present in the lower courses. 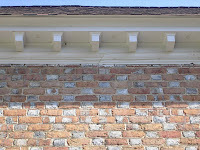 The south door frame shows the effect of a clumsy restoration as do several of the windows and sections of brick about the structure, most notably the north wall. The west doorway was likely originally a segmental arch but is now a flat one with voussoirs and, as the south door, a recent set of doors. Added to the east wall is a completely new structure that obscures the brickwork almost entirely. There is a one small window asymmetrically placed on the north wall that is, I believe?, behind the original pulpit. The dental molding at the roof is considered to be original, and the glazed brick is of considerable interest -- a closeup of a glazed brick is included in the illustrations. 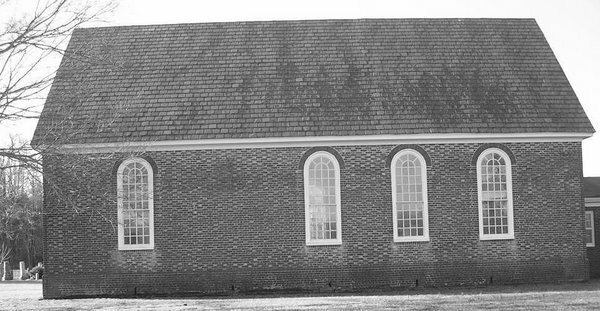 The church was abandoned after the Disestablishment and taken over by a local Black Baptist congregation that still uses it to this day. It is again pleasing to see an ancient edifice still in use.